I'm not sure why we got into puppetry. 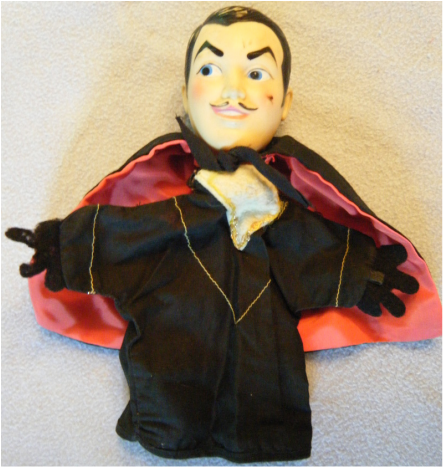 It could be that we always had puppets around the house (like Zorro, Minnie Mouse, and finger puppets we got for Christmas) or it could be because puppets were on TV (Captain Kangaroo, Kukla, Fran, and Ollie, Lamb Chop, and the list goes on...). Who would not be inspired by watching the puppet show in the Sound of Music? 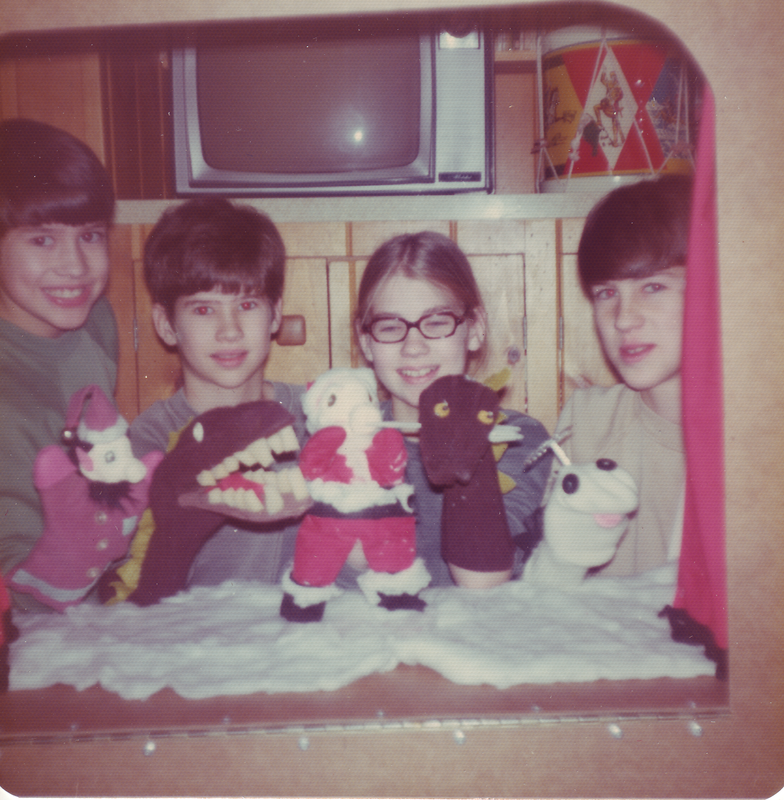 We started by making sock puppets and quickly moved into making marionettes once we started receiving marionettes as Christmas and birthday presents. We built two theaters with our father. We sewed our own curtains, wired our own lighting, built our own scenery and wrote our own scripts. Christmas plays became an annual tradition and resulted in much sibling drama behind the scenes as well as on stage. The tradition actually passed to the next generation before fading away. My enthusiasm about dabbling in puppetry set me apart from the other candidates when I interviewed for a college scholarship and was a significant factor in earning a full ride for my undergraduate degree. 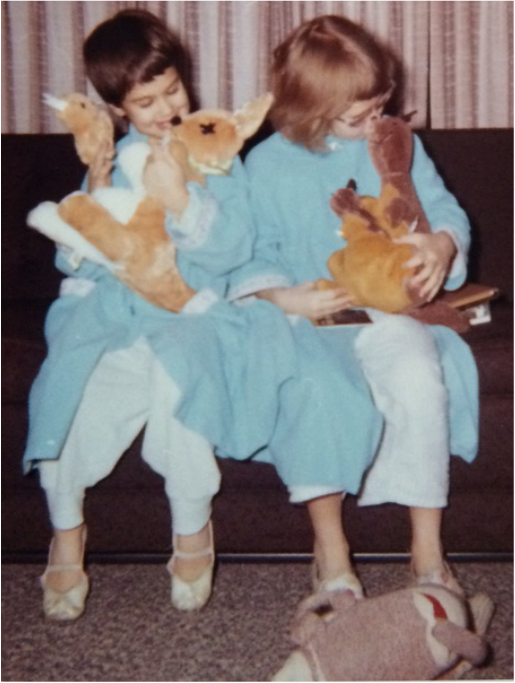 One of the first puppets I can remember is the Joey hand puppet that came in the pouch of my sister's Christmas Kangaroo. Notice my sock monkey (Kee-kee) in the foreground. Kee-kee was always photo bombing family pictures. Zorro is one of the first hand puppets we had. He came with a nifty cape and, according to my older sibs, a hat with chin strap. His felt fingers were perforated by pet teeth. Minnie is the same vintage as Zorro. 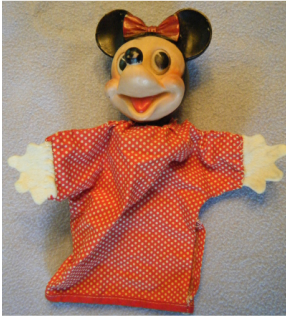 Minnie's polka-dot blouse has a split seam. 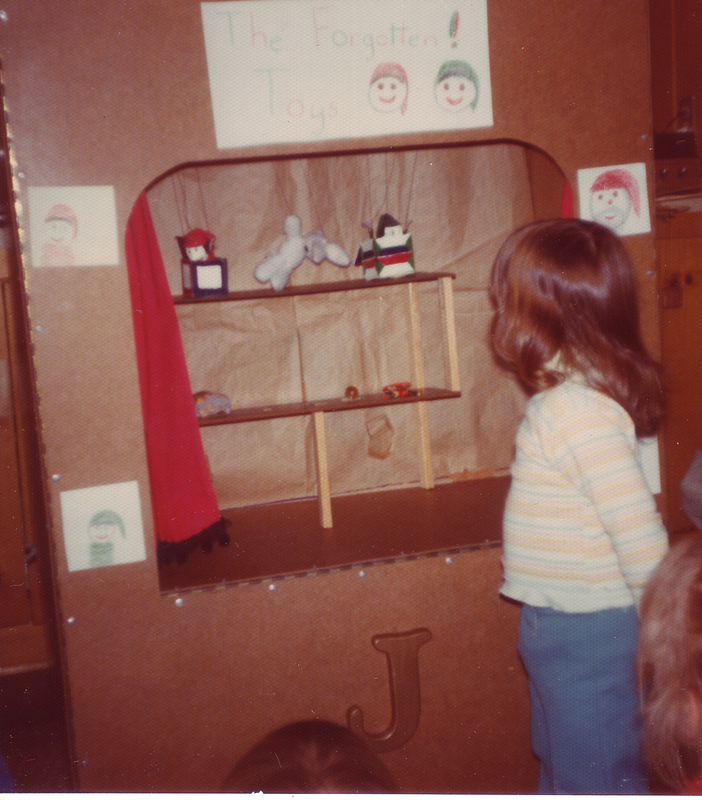 The "J" theatre was our first stage. It was built from masonite, piano hinges, and a broom stick with studs and wing nuts to support the stage floor. It was clever because it folded flat for easy storage. A curtain was added to make scene changes less obvious. 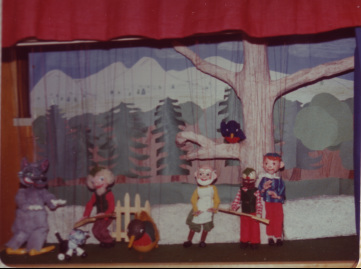 We later added a backdrop so that the puppeteers wouldn't be visible like in the performance of "Friendship in the Garden" in the photo. 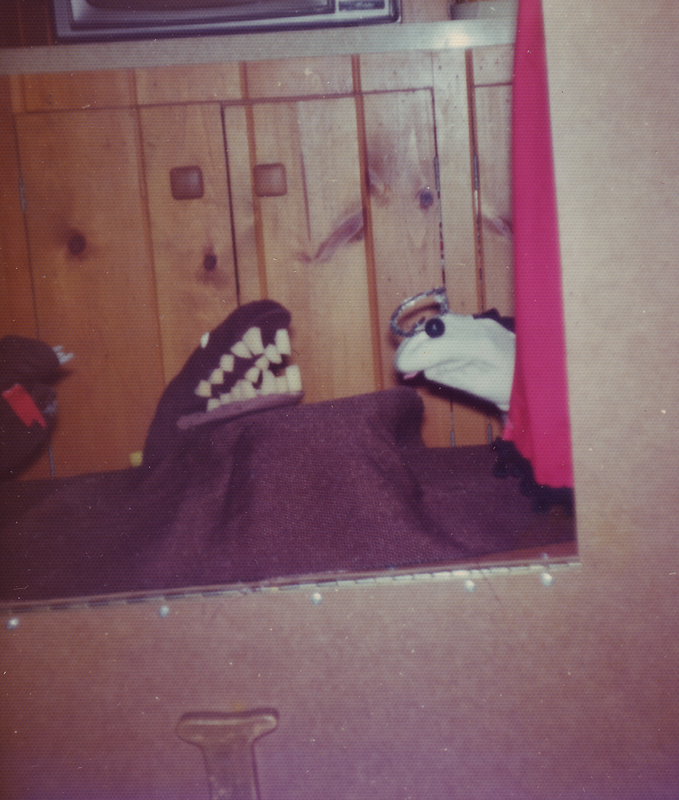 We would try to hide our bodies under the stage when hand puppets were part of the performance. The inevitable outcome would be the stage pitching forward onto the front rows of the audience. This severely limited the number of standing ovations we received. "Friendship in the Garden" featured my little boy Pelham puppet (I named it Nathan) and our homemade "Betsy Bobbin". Not shown is the Pelham caterpillar owned by my younger brother. 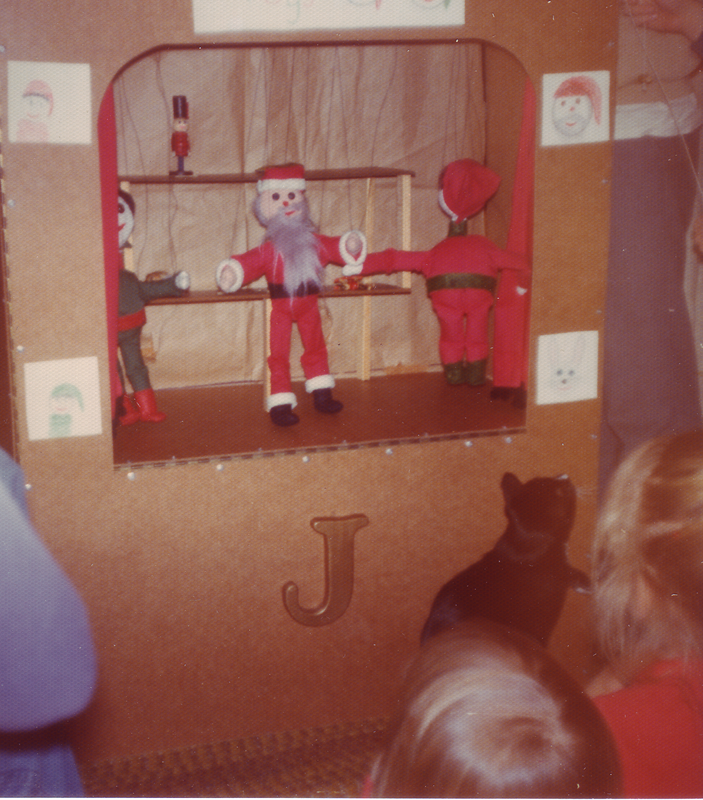 "The Forgotten Toys" (just coincidentally similar to "Rudolf") featured custom built jack-in-the-box marionettes that actually sprang out of their boxes. It seems like every year the play featured a new Santa and/or Mrs. Santa. The Red Elf and Green Elf were always cast in supporting roles. In this particular performance, a young fan rushed the stage when the jack-in-the-boxes mysteriously came to life. It is hard to tell from the photograph but this is our second stage. It featured a bridge for the puppeteers, real backdrops, changeable flooring, wings, lighting, and curtains. This is our production of Peter and the Wolf. Nathan, Gepetto, the Wolf, Figaro the Cat, and one fuzzy haired hunter, are all Pelham puppets. The other hunter is a Pelham kit puppet. We often redressed Pelham characters to suit our needs. The bird and the duck we made from scratch. The tree was paper mache. The stone wall had a wooden gate that the puppets could open and close - a key element in the story. I don't remember for sure, but I believe we used a record album as the sound tract for the play. I don't remember the name of this zoo themed production; it was probably the last I was involved in. New characters included the fuzzy panda, an ostrich, and a zookeeper. The homemade snowshoes at the front of the stage were worn by the arctic hunter (a redressed Pelham marionette that is not in the photo). Zorro has a vinyl head. He has a dirt mark on his cheek - sort of like the "mark of Zorro". 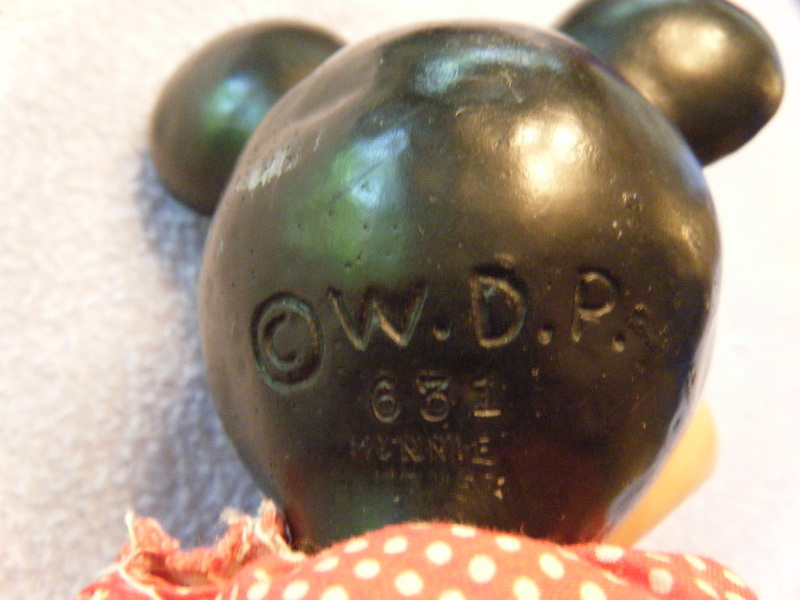 Minnie Mouse has a Walt Disney Productions (W.D.P.) mark on her neck. "The Dragon Who Saw the Light" was one of our Christmas performances. An evil dragon (center stage) was trying to destroy Christmas. This dragon's mouth was made using a bellows from an old pipe organ a neighbor dismantled. The teeth were pieces of old foam padding. The angelic dragon with the tin foil halo is a more traditional sock puppet. In an unexpected plot twist, the evil dragon becomes good and Christmas is saved. The entire cast and crew of "The Dragon Who Saw the Light". Santa and Jingles the Elf were experiments in using clay to sculpt more realistic faces. The clay heads turned out to be too heavy for the average finger to support. Consequently, tired fingers would droop and heads would roll. Younger viewers were traumatized when Santa lost his head. Santa actually had legs and was operated through a hole in his shirt. 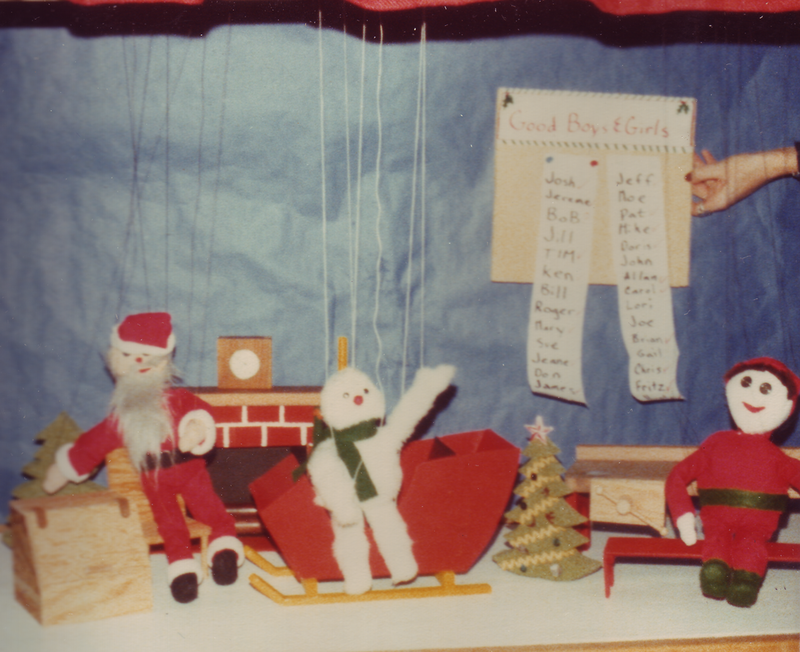 The next generation of Santa was a marionette. The marionette Santa was made from cloth. He was rather anemic but did have a fake fur beard. He was later replaced by a Santa with a carved wooden head and a fuller physique. Pet cats were a constant hazard to a performance. They were fascinated by the marionette strings and would think nothing about taking Santa down. "Fluff-Enuff" featured a lonely little furry creature that comes to live with Santa at the North Pole. Every new production required at least one new character, more sophisticated props, and at least one special effect. This play had an operational woodbox and a workbench with a functional vise. The clock on the mantle is really a pocket watch in a wooden case. The sleigh was supposed to be able to fly out carrying Santa and Fluff-Enuff but it was too heavy for take-off. I think that the very first puppet I owned was a finger puppet of an old man. He had arm armless conical body of light blue and white checked fabric. His head was a wooden sphere and he had a small dowel nose. He arrived on Christmas morning. Several of my siblings received finger puppets at the same time. I seem to remember someone getting a Scottish man and someone else a bandana wearing girl. 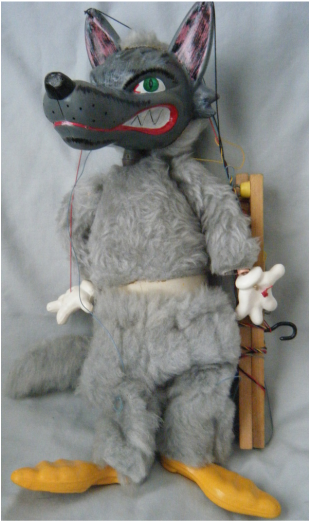 The first puppet I ever purchased was a vinyl hippopotamus head with a moveable mouth and a purple cloth tube for a body. I think I called him Harry (because he had a little tuft of hair glued to his scalp). I bought him from a variety store on a rainy day while on vacation. I used it to drive one of my older sisters crazy. His mouth took some force to close and I remember my hand sweating inside the vinyl head. My next hand puppet was a Yogi Bear complete with felt necktie. The Muppet Show became a craze during my teenage years. I received a dog puppet that looked something like Rolf and purchased a felt puppet of Kermit. I pretended I was a muppeteer by attaching long dowels to their hands and operating their hands by using my hand that wasn't operating the mouth. I tried to entertain my family with improv ventriloquy. Nathan is my most prized marionette. He was a Christmas present from my parents. 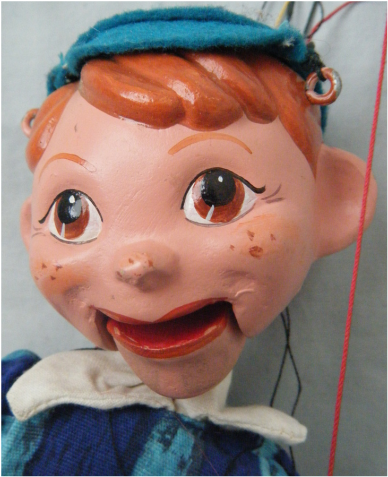 He is a Pelham puppet (his Pelham name is something like "Boy"). His ring finger on his left hand broke off and had to be glued back on. 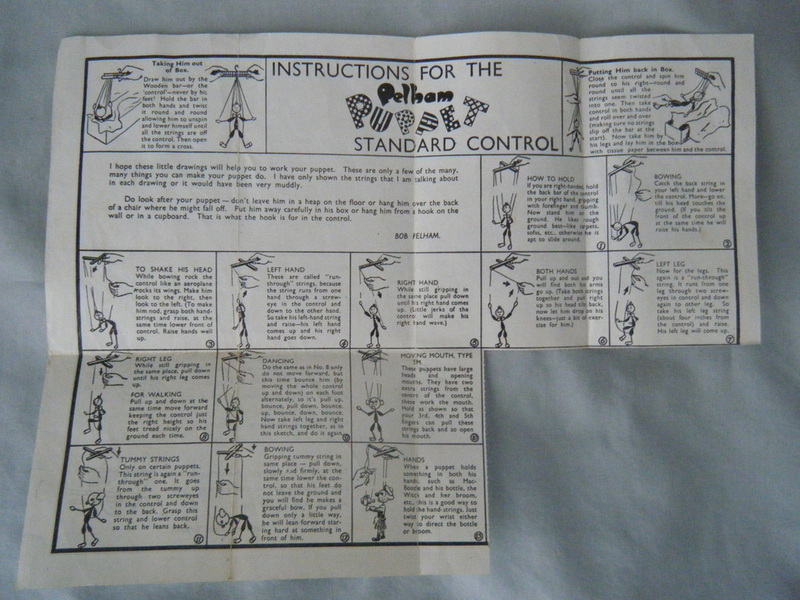 Pelham illustrated many of their marionettes on the boxes. This was great advertising on their part. I decided I wanted Figaro the cat from Pinocchio to be a companion to Nathan. My parents took me to the toy store to pick him out as a birthday present. 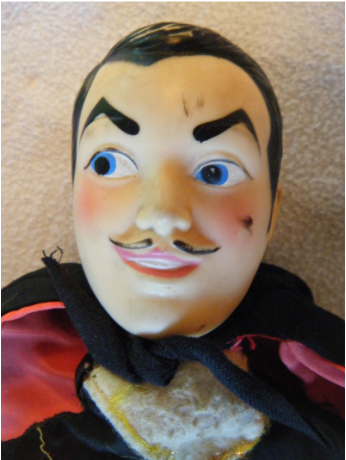 We had lots of "nice guy" marionettes but we needed a "villain" if we wanted our plays to have any drama. 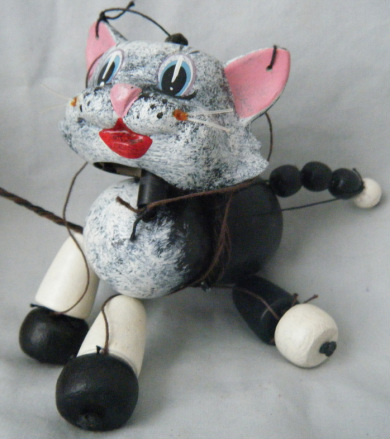 I bought along my Christmas money when my parents took me to the toy store to buy Figaro. The Pelham Wolf caught my eye and made me long to perform Peter and the Wolf. He had a scary head but he was wearing Mickey Mouse gloves, blue and purple flowered pants and floppy yellow shoes which made him seem comical. I wanted a classical all fur wolf. I paid $16.64 for the wolf (I still have the receipt) and went up to the corner craft store and bought fake gray fur. I stripped off the wolf's pants and made him fur trousers. Unfortunately I didn't make the waist high enough so his white porcelain body shows through. I seriously considered repainting the hands and feet but ended up leaving them in their original state. Nathan came with a sheet that included instructions for making the marionette perform all sorts of actions. I practiced all of them. One of the things that makes Nathan so awesome is that he has a movable mouth. By manipulating the strings I could make it seem like he was talking during a performance. His jaw squeaked and clacked but it seemed real to me. I suspect my parents picked him out for me because he had freckles like me. That same Christmas my younger sister received a Pelham Gepetto and my younger brother received a Pelham Caterpillar. Figaro requires a lot of finesse to move in a cat-like manner. He would get so badly tangled that I would have to cut his strings and restring him. 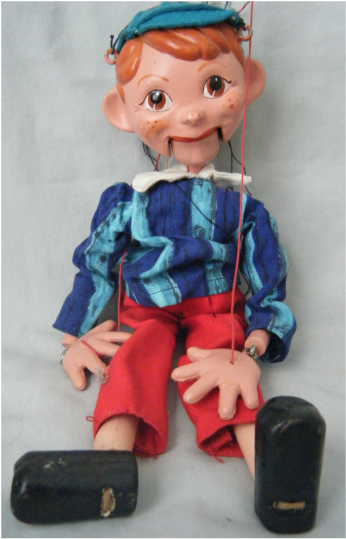 This is another Pelham marionette I received as another present from my parents later on. 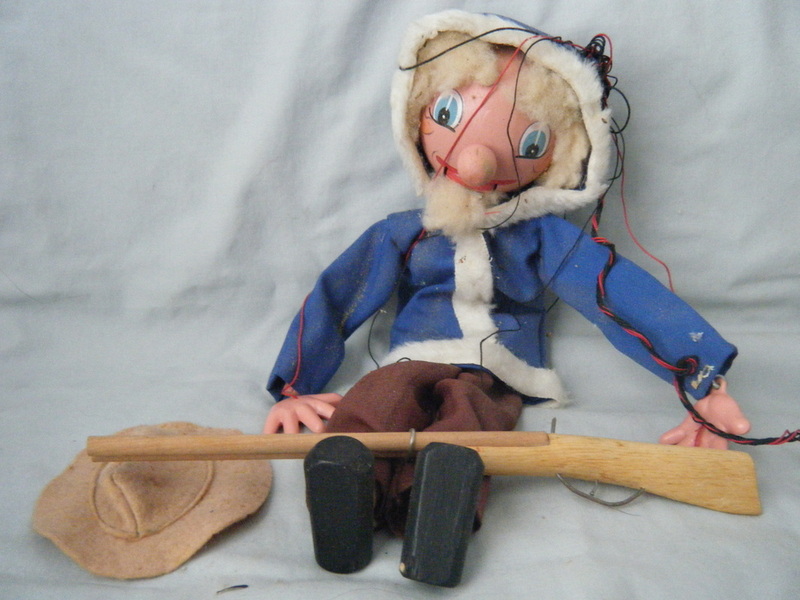 He was originally a "Farmer" and came with a wooden rake and the floppy hat on the ground in the photo. He was redressed depending on the play we were performing. He was a hunter in "Peter and the Wolf" and an arctic explorer in "Fluff-Enuff". We made the wooden rifle because a rake wielding hunter is not very threatening. 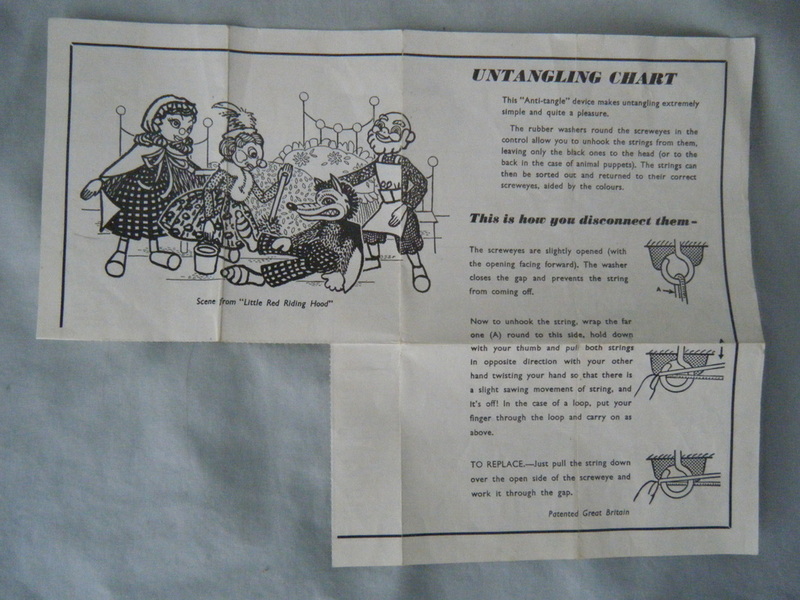 The back of the instruction sheet came with a guide for untangling marionettes - an activity that was often required. The missing corner of the sheet is where I cut out a response form to become a member of the Pelpups and receive the Pelham newsletter/magazine from England. I eagerly awaited every issue and would read through all the plays and learn about new marionettes. One magical issue had the basic plans for an amazing stage. We convinced my parents that we needed a replacement for the now woefully inadequate "J" theater. They agreed to let us build the new theater if we would play for it ourselves and keep a budget for expenses. We all chipped in birthday and Christmas money as well as allowances. I believe my parents helped pay for the shortfall. My father helped us spec out all the lumber and hardware required and then took us shopping at the local lumber yard. He had us measure out all the lumber and he helped us saw and drill the parts. We added our own improvements to the original design. I don't think I'm exaggerating too much when I say it turned out to be the best stage ever. 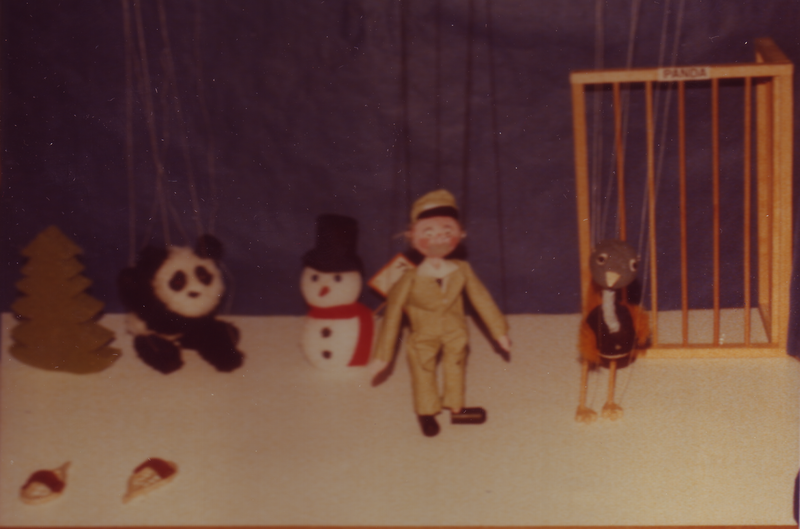 With weekly allowances of a quarter or fifty cents, it was not practical for us kids to try to build our company of marionettes from $20 Pelham imports. We decided that we would have to create our own marionettes from scrap fabric and wood from my father's scrap wood barrel. The wood barrel lived behind the furnace and it always took some courage (along with a flashlight) to venture into the hot, dark, dusty, spidery place to look for materials. 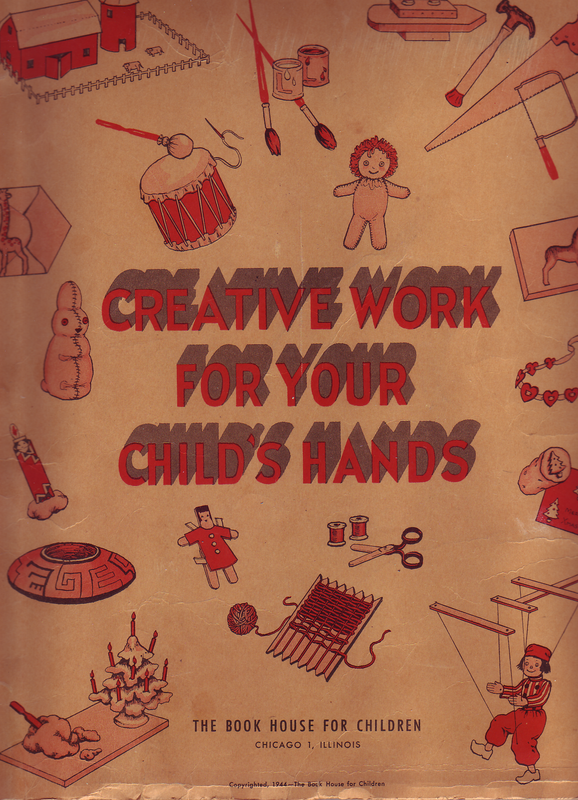 We found the basic pattern for a cloth marionette in "Creative Work for Your Child's Hands". My mother kept this book, and others, along with a cabinet full of odds and ends available to us throughout our childhood. 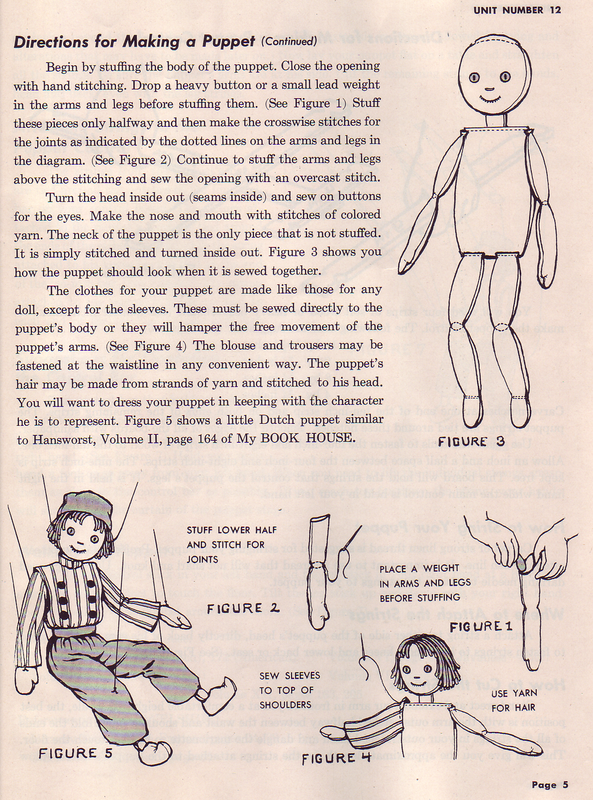 At the end of the book is a pattern for a Dutch boy marionette. We decided to change the marionette into a little girl so that Nathan would have a leading lady to star opposite him in our plays. 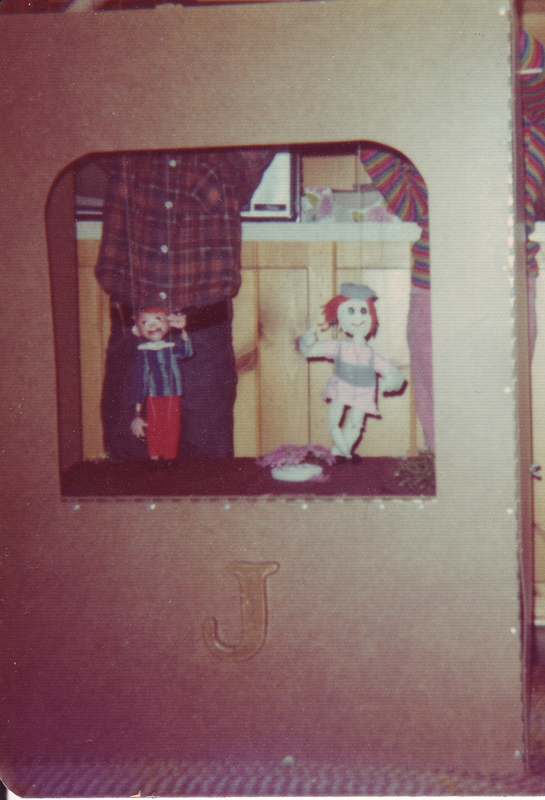 The result was the smartly dressed (in pink and blue) marionette known as "Betsy Bobbin". Contrary to the illustrations in the book, she did not move with elegance and grace no matter how hard we tried. We hand sewed many marionettes and my older sister eventually taught us how to use my mother's sewing machine. We used the cloth body plan for elves, Santa Claus, and several other characters. Eventually, we reverse engineered the Pelham design, used in Nathan, to create marionettes from dowels, screw-eyes, and hand carved pieces. This book served as the spring board for many of the projects we made as children. Just looking at the cover I can see Tuffy the tug boat, the rag doll, the one-eared rabbit, envelope animals, a loom, and the marionette. I'm pretty sure that I cut the marionette pattern out of the original book. I now have a used copy of the book for myself. Just paging through the book brings back all sorts of wonderful memories.